Like Alex Stalock and Casey DeSmith who both signed three-year deals earlier this season, Copley happened to be in a perfect situation to secure his future. The 27-year old netminder had just two games of NHL experience under his belt prior to this season but has performed admirably behind Holtby in Washington. While his .903 save percentage could be better, the former Michigan Tech goaltender has gone 10-5-3 this year and shown that he can at least handle the role at the NHL level. Still, three years is obviously a long time to commit to a goaltender who is relatively unproven. In fact, it’s not clear what the Capitals situation will even be in the near future given that Holtby’s current contract expires after the 2019-20 season. The team has young stud prospect Ilya Samsonov in the minor leagues developing and will be only able to protect one goaltender in the expansion draft. Holtby has obviously done enough to prove his worth in the NHL but is currently carrying a .907 save percentage on the year, the same number he finished last season with. Whether the Capitals decide to extend Holtby or move on and hand over the crease to Samsonov at some point, Copley will have some certainty in his place in the league. His $1.1MM cap hit will also be almost entirely buried if he is sent to the minor leagues at any point over the next two seasons. In 2021-22, it would come completely off the books. The Washington Capitals have some interesting decisions to make in the next few months when it comes to their goaltending. The team has starter Braden Holtby under contract for just one more season after this one, while backup Pheonix Copley will be an unrestricted free agent. Throw in the fact the team has highly-touted prospect Ilya Samsonov in Hershey in the AHL as well as Vitek Vanecek, who is about to play for the AHL All-Star game, and the team has quite a bit of depth. The team’s first decision, according to the Washington Post’s Isabelle Khurshudyan is general manager Brian MacLellan must decide whether they intend to bring back Copley next season. Copley was having an impressive season until recently with 10 wins in his first 15 games, but has struggled more recently during Washington’s seven-game winless streak. In fact, Copley has gone 0-3-1 in his last four appearances, allowing 15 goals, although two of those appearance were in relief of Holtby. Of course, MacLellan said just two weeks ago that he was interested in retaining the services of Copley for another year. Regardless of his recent struggles, bringing Copley back for another year would make sense as Samsanov, deemed the goaltender of the future in Washington, has struggled in the AHL with a 3.14 GAA and a .878 save percentage this season. Another year of Copley would give the prospect more time to develop as its just his first year in North America and knew little English when he arrived here last summer. However, the 21-year-old Samsanov has had a recent string of solid performances as he has gone 4-0-1 with two shutouts in his last five games, but barring injury isn’t likely to make his NHL debut this year. If someone gets recalled this season, it’s likely to be Vanecek, who is 10-8-2 with a 2.82 GAA and a .903 save percentage. Vanecek is also a coveted prospect as he was a second-round pick in 2014. Khurshudyan also points out that whatever the team decides to do with Copley could have an effect of whether the team brings back Holtby after the 2019-20 season. With lasting salary cap issues, the team might be better off turning to Samsonov as their starter in two years rather than offer the then 31-year-old an expensive, long-term contract extension. It will likely be his last chance at a big contract, so it’s unlikely he would agree to a short-term deal to stay in Washington. Holtby returned to the All-Star game this year and is having another impressive season, but the team may have to decide between retaining Holtby or Nicklas Backstrom, who will both be unrestricted free agents in two years. Regardless, if the team opts to make Samsonov the goalie of the future, how much NHL experience will Samsonov get if Copley is in his way next season? In an unexpected twist, the Washington Capitals – on the road in Winnipeg to face the Jets tonight – will be without starting goaltender Braden Holtby. The Washington Post’s Isabelle Khurshudyan was the first to report that Holtby had been ruled out and that backup Pheonix Copley would get the start, with an emergency backup suiting up for the Caps. TSN’s Brian Munz adds that it is an upper-body injury for Holtby, although it remains unclear how and when the injury occurred and to what extent. Washington will put their trust in Copley for a second game in a row, as the 26-year-old gets set to make just his eighth career NHL appearance. Copley won the Capitals’ backup job by default in training camp, but has performed up to expectations thus far. In five games, he has three wins, a .904 save percentage, and a 2.91 goals against average. However, Copley faces a tough test, going up against the talented Jets after facing the Minnesota Wild just last night. Regardless of how Copley performs this evening, it’s fair to say that he will stay in net barring an injury. The Capitals will dress local emergency backup Gavin McHale as their second-string option tonight, reports Caps radio host Ben Raby. McHale is the goaltending coach for the women’s hockey team at the nearby University of Manitoba. The 31-year-old is a Manitoba alumni himself and played two seasons in the WHL with the Seattle Thunderbirds and Lethbridge Hurricanes. Even at a hulking 6’7″, Washington is unlikely to stick McHale in the net unless there are extremely extenuating circumstances. Meanwhile, the concern for the Capitals is far beyond just one result and no one will blame them for dropping tonight’s match-up in Winnipeg, as they were underdogs even with Holtby in net. Instead, the focus is on the starter and his injury moving forward. Perhaps more than any team in the NHL this season, Washington can ill-afford a long-term injury to their starting goaltender. Khushudyan indicates that the injury is not serious and Holtby is considered “day-to-day”, but the ailment is enough that he could not even dress as the backup tonight. We will likely know more in the coming days. The New York Rangers and new head coach David Quinn sent an early message to forward Vladislav Namestnikov Saturday when the team benched him in favor of veteran Cody McLeod for today’s game against Buffalo. While Quinn said the move was meant more to reward the play of McLeod, it’s obvious the team’s new coach is sending a message to Namestnikov, according to New York Post’s Larry Brooks. The scribe believes this is Quinn’s message to the team to play physical “in your face” hockey and not doing that, is unacceptable. Namestnikov didn’t make that adjustment in his game against Nashville on Thursday and hasn’t played physically all preseason. Enter McLeod, the 34-year-old veteran. 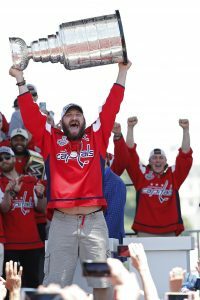 The Athletic’s Chris Kuk, in a mailbag piece (subscription required) writes that while the Washington Capitals could have considered going after a backup goaltender in the waiver wire last week, the team’s No. 1 priority was going after a forward to replace the loss of Tom Wilson, who was suspended for 20 games. They did that when they claimed Dmitrij Jaskins. However, Kuk doesn’t believe the team would have gone after a goaltender anyway as they feel that starter Braden Holtby can take a bigger load early in the season as the team monitors the play of Pheonix Copley. If they feel at the trade deadline that Copley isn’t the answer, they can trade for one then. While the Philadelphia Flyers have little to worry about when it comes to offense when it has two players capable of putting up 30 goals in James van Riemsdyk and Wayne Simmonds, the team does have to worry about its defense. Even with two of the top young defenders on their roster in Shayne Gostisbehere and Ivan Provorov, the team really needs to develop second year players Robert Hagg and Travis Sanheim, according to Philly.com’s Sam Carchidi. Both players had their ups and downs last year. The physical Hagg started the season strong, but struggled as the season wore on, while Sanheim was sent to the AHL early on in the season last year and came back much improved. If the two can show some consistency this year, the Flyers chances of a playoff run could be much improved. The Washington Capitals have four goaltenders under contract for the coming season, Vezina Trophy-winning starter Braden Holtby and three unproven young backups: Pheonix Copley, Vitek Vanecek, and Ilya Samsonov. The defending Stanley Cup champions do not necessarily need to make any changes to their current depth chart and would most likely be fine this season with a tandem of Holtby and the hot hand among the three prospect keepers, with Copley getting the job initially. However, championships are built on being prepared to handle the worst. This current iteration of the Capitals, while almost identical to the team that hoisted the Cup just months ago, is not. The only major departure out of D.C. this off-season was backup Philipp Grubauer, who was traded away to the Colorado Avalanche where he could compete for the starting job. Grubauer was far from a typical backup last season; the 26-year-old made 35 appearances, including 28 starts, which was tied for 37th-most in the league, among the NHL’s most active backups. When Holtby went through a rough patch down the stretch, Grubauer took over the reins as the starter and even got the call in the Capitals’ first two postseason contests. His 2.35 GAA was fifth among goalies with 30+ appearances, while his .923 save percentage was eighth among the same group. Grubauer was as solid as they come last season. Meanwhile, Holtby quietly had the worst season of his NHL career. His .907 save percentage and 2.99 GAA were a major deviation from his career performance, as he struggled with streaky play all year long. Without Grubauer, the Capitals likely would have had a worse playoff seeding and potentially would not have won the Stanley Cup. So what happens if Holtby struggles again? Normally, it would be easy to say that the star goalie will regress positively back to the numbers that made him a top ten NHL stopper. However, after a deep playoff run added 23 appearances to his workload and significantly shortened his summer, it is hard to imagine that Holtby is fully refreshed and ready to be back in Vezina shape. His play last year may not be an indication of what is to come, but it may be a more accurate comparison for Holtby’s probable performance in 2018-19 than would his three prior seasons of dominant play. Without a reliable backup, the Capitals may be hesitant to lessen Holtby’s workload, but if they don’t they could risk another breakdown. Either way, the Washington backup goalie will not be a non-factor this season. The first option behind Holtby will likely be Copley. Copley, 26, is a career minor leaguer with just two NHL appearances. In contrast, every team in the NHL last season began the year with a backup goaltender that had more than two previous appearances. Copley is also far from a prodigy; his numbers with the AHL’s Hershey Bears last season were poor and he only returned to Washington as nothing more than a toss-in to the Kevin Shattenkirk trade. So far in the preseason, Copley has made 41 saves on 46 shots for a paltry save percentage of .891. While the Capitals have put their faith in Copley to this point to be a serviceable backup, the undrafted free agent out of Michigan Tech has never been considered anything but minor league depth before now. Jumping to a primary backup for a goalie who may need substantial assistance is quite the task. Next up would likely be Vanecek, the Captials’ 2014 second-round pick who has not yet lived up to expectations. Vanecek is still only 22 and has room to improve, but since coming to North America three years ago, he has impressed at the ECHL level and failed to do so in the AHL. Vanecek’s numbers while splitting time with Copley on the Hersey Bears last year were even worse; Copley had an .896 save percentage and 2.91 GAA, while Vanecek had an .888 save percentage and 3.04 GAA. Vanecek has potential, but is not ready to be an NHL backup. Samsonov, in his first season in North America, is easily the most talented of the group. A 2015 first-round pick, Samsonov has been playing significant minutes in the KHL since he was 18. In three seasons with Metallurg Magnitogorsk, Samsonov was the primary backup to Vasili Koshechkin and posted a .925 save percentage or better each year. Some hope that young Samsonov can step in and immediately provide that same level of support for Holtby. However, the adjustment to the NHL – and even AHL – can be a difficult one when coming over from Europe. There is no guarantee that Samsonov’s performance will immediately translate. There is also a question of whether Washington will want to harm their heir apparent’s development by costing him starts as the NHL backup. As such, the Capitals are likely to play it safe with Samsonov this season. Washington’s in-house options to back-up Holtby are not inspiring. The team could absolutely move forward with this group and hope that Holtby can make 65+ starts without a hitch, but there is ample risk involved with that strategy. Normally, it would be tough to significantly upgrade the goaltender position at this time of year, but not this season. Intriguing names are already available and more soon will be. On the free agent market, veterans Kari Lehtonen and Steve Mason remain unsigned. The Capitals do not have much cap space, but if either is willing to take a show-me deal, they would become a massive improvement on the team’s goalie depth. However, both players have been available for much of the off-season and the Caps have yet to pull the trigger. They may instead have their eye on younger, more affordable options. Michael Hutchinson, a free agent signing of the Florida Panthers this summer, is one possibility, as he was already placed on waivers at the earliest possible time. St. Louis’ Jordan Binnington and Vegas’ Oscar Dansk are other waiver options who may have slightly more upside than Copley. That is just the first subset of the backup goalie market though. Teams like the Toronto Maple Leafs (Curtis McElhinney, Garret Sparks, Calvin Pickard), Philadelphia Flyers (Michal Neuvirth, Anthony Stolarz, Alex Lyon), and Los Angeles Kings (Peter Budaj, Jack Campbell, Cal Petersen) have major logjams in goal that are prime for a trade or waiver claim. Washington could also wait to target one of a number of third-string goalies trying to be slipped through waivers, such as Al Montoya, Eddie Lack, Andrew Hammond, Anton Forsberg, Zane McIntyre, Jared Coreau, or J-F Berube. The opportunities are out there to upgrade at backup goalie. The only question is whether the Capitals make the move before it’s too late and those opportunities have disappeared. The biggest news out of Washington Capitals’ training camp is that there isn’t any news. As the defending Stanley Cup champs face the Boston Bruins in the second meeting of the two teams already this preseason, there simply isn’t much to watch for in terms of camp battles and roster spots. GM Brian MacLellan and the Caps front office succeeded in keeping their championship roster together as well as any Cup winner in recent memory and are prepared to go for another title in 2018-19. Of the 25 players who took the ice in the postseason for the Capitals, 21 return this season. The glaring absence is obviously backup goaltender Philipp Grubauer, who was traded away to the Colorado Avalanche early this off-season. Another name who Washington fans were upset to see go was career Capital Jay Beagle, who signed with the Vancouver Canucks after ten seasons in D.C. Outside of that duo, the other two players who saw playoff action for the Cup winners were defenseman Jakub Jerabek, who played in two postseason games, and forward Alex Chiasson, who saw less than nine minutes of ice time in the playoffs. The team also lost regular season contributors Taylor Chorney, Tyler Graovac, and Anthony Peluso. When any team can return 21 players to a roster limited to just 23, the result of few departures is few opportunities in camp. Rather than sign or acquire a backup of similar pedigree to Grubauer to backup starter Braden Holtby, the team seems content to let veteran minor leaguer Pheonix Copley try his hand at the job. With only youngsters Ilya Samsonov and Vitek Vanecek, neither of whom have made an NHL appearance, also under contract, there really is not much of a competition to replace Grubauer. On the blue line, the top-four will line up exactly as they did in the postseason and Christian Djoos will pair with either his postseason partner, veteran Brooks Orpik – who was traded away and then re-signed this summer, or his frequent regular season partner, Madison Bowey. Orpik versus Bowey is one situation that could potentially be defined as a camp battle, although both are guaranteed roster spots. Up front, the top-nine is also locked in as the same group who dominated in the playoffs, leaving only fourth line and an extra skater spot or two up for grabs. The team has shown a commitment to Devante Smith-Pelly and Chandler Stephenson and the pair are almost certainly the energy liners on opening night. The one true position battle is at the final spot, where Travis Boyd and free agent addition Nic Dowd will fight it out to skate on that fourth line. The loser is likely to begin the season as an extra skater beside import winger Sergei Shumakov. If you’ve been keeping count, that’s the entire roster: almost all familiar names and only one or two spots up for grabs. There won’t be many questions in need of answering out of Capitals camp, but the big question remaining is whether failing to insert some fresh legs or properly replacing Grubauer will come back to bite Washington in their attempt to repeat. With the team trying to make a Stanley Cup run over the past few years and finally capturing one, youth is in rare supply in Washington as the team has made it clear that it prefers to play its veterans rather than risk mistakes from youngsters. The only player who is still on an entry-level deal is Vrana, who has had a turbulent career so far with the Capitals. After spending a couple of years in the AHL, he finally got a full season with Washington this year, but the former first-round pick was never able to secure a full-time role in the team’s top six as he bounced around on different lines all season. He finished the year with 13 goals and 27 points, but put up another three goals and eight points in the playoffs. He has a chance to take on a full-time role on the team’s second line this season and hopes for a breakout season. The Capitals have only a few significant free agents for next season as many of their deals are league-minimum contracts, which is necessary considering the amount of money the team has expended in keeping their roster together. 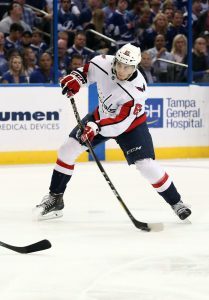 Perhaps the biggest name on their free agent list will be Burakovsky, who many thought might have a breakout season with a bigger role last year. However, Burakovsky’s numbers decreased as his season was plagued with injuries. His 12 goals and 25 points in 56 games was the worst since his rookie season. However, he did post six points in 13 playoff games. If he can stay healthy, the 23-year-old could provide the team with more offense. Due to the Stanley Cup win, the team was able to find a way to bring back several key role players on cheaper deals. The team assumed they would lose Smith-Pelly to free agency, but the 26-year-old opted to return for another playoff run, while long-time Capital Orpik was traded away, waived and opted to return for another year. The team does have to worry about Backstrom in two years. The team’s No. 2 center is still posting excellent numbers as he tallied 21 goals and 70 points last season, the fifth straight season he’s reached at least 70 points. However, the team will have a tough decision to eventually make as the veteran will be 32 when he gets awarded a new contract, which can get into a dangerous area when players hit their early 30’s. Holtby will be another interesting case. After temporarily losing his starting job to Philipp Grubauer for a few weeks near the end of the season due to poor play (2.99 GAA, .907 save percentage), Holtby snapped out of it and posted dominant numbers throughout the playoffs (2.16 GAA, .922 save percentage) showing he still has what it takes to be a top-of-the-line goaltender. While the 28-year-old should still be in his prime in two years, the team also has top goaltending prospect Ilya Samsonov arriving in North America this season. He’ll likely start the season in the AHL, but he will likely be ready to take the reigns once Holtby’s deal expires. The team decided more than a year ago that they were going for it, which worked out perfectly last season. The team has done a fantastic job locking up its core, although many of the pricetags are quite generous, which could come to hurt them. However, now that the team has won the Stanley Cup, the team is going all out to win another as the team has locked up all of their critical free agents this year, signing Carlson as a long-term answer as their top defender as well as locking in Wilson. That gives them a solid core for the next many years. That should give them two or three years to attempt to capture another title. However, eventually this team will be weighed down by these contracts, much like the Chicago Blackhawks, but Washington is focused on the future. The team may be forced into handing out another long-term extension to Ovechkin in three years, depending on how the 32-year-old fares in three years, but the deal would unlikely be more than he is already being paid. The Capitals are quite used to dealing with little to no cap space and will have to do that again for a number of years to come. However, the team has managed to keep not just the core of their team together, but have also managed to bring back multiple role players at bargain prices to keep this team at a Stanley Cup level. With new deals to players like Carlson and Wilson, should challenge for a few more years, but age and those long-term deals will eventually hold the franchise after that. However, the team has already proven that their tactics are worth it after winning it all last season. If it ain’t broke. Don’t fix it. At least that seems to be what the Washington Capitals believe. After capturing the Stanley Cup last season, the team completed one of its final moves when it locked up forward Tom Wilson to a six-year, $31-year deal. And suddenly, the team miraculously has managed to bring back almost its entire roster for next season, according to J.J. Regan of Yahoo Sports. While all teams are forced to shake up their roster and allow for the losses of free agents after each season, the Capitals are an unusual situation, considering the number of potential free agents as well as how tight their salary cap has been over the past two years. It wasn’t going to get any better, yet still, the team still was able to re-sign stud defenseman John Carlson (eight years, $64MM) as well as find a creative way to trade defenseman Brooks Orpik to Colorado and then bring him back after the Avalanche waived him. They also managed to hold onto trade deadline acquisition Michal Kempny (four years, $10MM). Sure, the team did suffer a couple of losses, including the loss of fourth-line center Jay Beagle and backup goaltender Philipp Grubauer. However, the team has people ready to step into those positions, including prospect Travis Boyd, free agent acquisition Nic Dowd as well as place long-time minor leaguer Pheonix Copley to fill in for a year, while the team waits for superstar prospect Ilya Samsonov to develop in the AHL for a year. Andrew Gross of Newsday wonders whether the New York Islanders would consider moving center Brock Nelson for a defenseman, now that the 26-year-old has agreed to a one-year, $4.25MM deal with the team. With quite a bit of youth in the wings and the team in desperate need for blueline help and the fact that Nelson could walk away from the team as an unrestricted free agent next season, a trade might make a lot of sense. Nelson has been quite productive for New York, posting at least 19 goals in his last four seasons. The Athletic’s Rick Carpinello (subscription required) analyzes and grades the season of New York Rangers center Mika Zibanejad, who took over the team’s No. 1 center position last season after the team traded away Derek Stepan. Many of the same questions about Stepan not being a No. 1 center now have fallen to Zibanejad. Yet, the 25-year-old definitely took his game up a notch, posting a career-high 27 goals in 72 games, but once again suffered an injury that interrupted his season. It marks the second straight year that Zibanejad has struggled with injuries, which is a concern and the center still must work on his consistency, including the fact that he posted no goals and one assist in the final seven games. Dave Isaac of the Cherry Hill Courier Post writes that if the Philadelphia Flyers are impressed by the play of 6-foot-5 prospect Philippe Myers in training camp this year, that could impact the role of defenseman Radko Gudas, who could then be on his way out as Myers physicality could replace Gudas role as well as the fact that Myers and Travis Sanheim were a great pair when they were together with the Lehigh Valley Phantoms of the AHL.